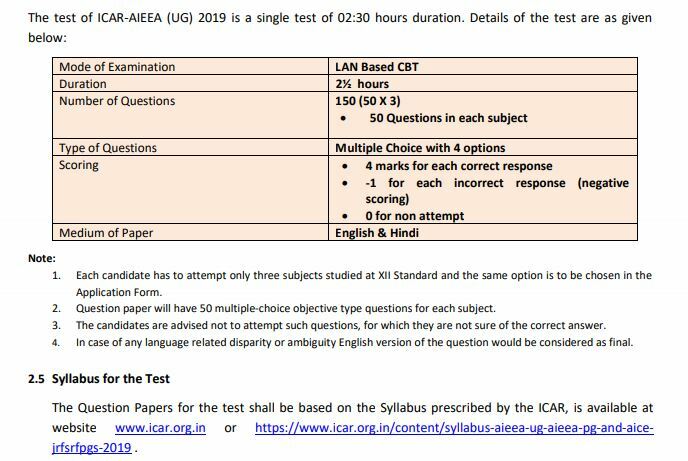 ICAR AIEEA 2019 application form has been released on 1st April 2019 through online mode. The examination is organized by the NTA (National Testing Agency). It is one of the national level entrance exams. The exam is a gateway to get admission in the bachelor degree and master’s degree programmes. The admission will be offered by the various agricultural universities and institutions within a country. From this article, candidates can get the details of ICAR AIEEA application form 2019. Candidates are advised to carefully read the instructions given on Information bulletin and then only proceed for the application form. The application form can be filled through online mode only. No other mode will be accepted for the submission of ICAR AIEEA 2019 application form. The filling of online application form has been started from 1st April 2019. The application form filling process will be continued to till 30th April 2019. Candidate must upload the scanned photograph and signature in the application form. The authority will provide the correction facility in the application form from 7th-14th May 2019. Take the printout of completely filled-in application form for further use. The application fee can be remitted through credit card/debit card and by using net banking of Canara bank. Once the application fee is remitted, it cannot be refunded. Here, candidates can access the official dates for the various events related to the ICAR AIEEA application form process. Here, we have given the step-by-step procedure to fill the ICAR AIEEA online application form. On homepage click on ‘New Registration’. Select the exam (AIEE UG/AIEE PG) and click on ‘Continue’. The registration page will be displayed on screen. Read the instructions and start filling registration details. Fill Candidate’s name, father’s name, mother’s name, gender, category, date of birth, examination centre, qualifying exam, subject group, contact details and other details. After that click on ‘Browse’ button and select the scanned images to upload. Candidates have to upload the photograph, signature and proof of handwriting in the prescribed format. Click on ‘Submit’ button and registration number and password will be sent to you. After that click on ‘Continue for Online Payment’ button and fill payment details. Click on ‘Pay’ button and submit the fee. After submitting the fee, take the printout of the application form. Here, we have mentioned the basic eligibility to appear in written exam along with educational eligibilities. Nationality: Applying candidate must belong to Indian national. Aadhaar Card: Aadhaar card is necessary to apply. Jammu & Kashmir, Assam and Meghalaya state candidates can apply without Adhaar card. Age Criteria: The minimum age of the candidate should be 16 years as on 31st August 2019. Qualifying Exam: Candidates pass the 12th or equivalent from a recognized board with PCM/PCB/PCMB/PCF subject combinations. Minimum Marks: Candidates of General/OBC/UPS category should secure 50% marks (40% for SC/ST/PC category candidates). Appearing Candidates: Such candidates can apply. Age Limit: The upper age limit to apply is 19 years as on 31st August, 2019. Qualifying Exam: Candidates should have bachelor’s degree in the respective field under the pattern of 10+2+5 (B.V. Sc. and A.H.), 10+2+4 and 10+6. Those having bachelor’s degree in10+2+3 pattern can apply for IARI Pusa and NDRI Karnal. Minimum Marks: Candidate should have passed with 60% marks (50% for SC/ST/PC categories) in the qualifying exam. Veterinary Anatomy/ Veterinary Anatomy & Histology, Veterinary Gynaecologyand Obstetrics/Ani. Reproduction, Vety. Medicine (Clinical/Preventive), Veterinary Parasitology, Veterinary Pharmacology and Toxicology, Veterinary Pathology, Wildlife Science/ Wildlife Health Mgt., Very.Virology, Vety. Immunology, Veterinary Microbiology & Immunology/Bacteriology, Veterinary Surgery & Radiology, Veterinary Public Health & Epidemiology/Vety. Public Health/Vety.Epidemiology/ Vety. Epidemiology & Preventive Medicine. The Chemistry Section of AIEEA UG 2017 was of moderate level in terms of difficulty. Candidates did not find any question that was said to be difficult. Physical Chemistry was given higher weightage in 2017. The other parts of the Chemistry were asked equally and were slightly easier. Physics was also the moderate level section of AIEEA UG 2017. Some questions were easy which could have been solved without any difficulty. Some questions were calculation based too, which took some time. The section had questions that were of moderate to difficult in the level of difficulty. The questions were dominated by Algebra and Calculus topics. A few tough questions were also there which took a little more time. The questions were dominated from Microbiology, Horticulture and Agrometeorology topics. The section had questions that were easy in level of difficulty. The questions were dominated from topics like Unit of Life, Diversity of Life, Organisms and Environment etc. Questions Left Blank- No mark. The level of questions asked in AIEEA UG is set as per the standard of 10+2 or equivalent exam. Every year the questions are asked in almost similar level of difficulty. Also, candidates get different sets having different questions. If we talk about overall analysis of AIEEA UG exam, the following table will explain it in a better way. Candidates should reach the test center 30 minutes before the test commences. Candidates, who reach the test center more than 15 minutes after the scheduled test time, may not be allowed to take the test. Candidates are required to bring admit card, photo identity and ball pen to the exam center. Any type of gadget and calculators are strictly prohibited inside the exam center. Visually Challenged applicants will get 50 minutes extra time to solve the test.